William COOKE. William married Elizabeth FOX. Elizabeth FOX. Elizabeth married William COOKE. F i Grace COOKE was born in 1663. She died on 2 May 1741. Valentine "The Imigrant" HOLLINGSWORTH "I" [Parents] was born on 15 Aug 1632 in Belleniskcrannell Parish of Sego, County Armagh, Ireland. He was christened in Quaker In Ireland. He died on 13 Oct 1710 in Shellpot Creek, Newark, New Castle, Delaware. He was buried in Union Church Yard, Newark Mm, New Castle. Delaware. Valentine married Ann CALVERT on 12 Apr 1672 in Lurgan Quaker Ceremonies, Shankell, Armagh, Ireland. Ann CALVERT [Parents] was born on 2 Nov 1650 in Kilmarling, County Down, Northern Ireland. She died on 17 Aug 1697 in Shellpot Creek, New Castle, Pennsylvania, now Delaware. She was buried in Newark Friends, Burial Ground, New Castle, Pennsylvania. Ann married Valentine "The Imigrant" HOLLINGSWORTH "I" on 12 Apr 1672 in Lurgan Quaker Ceremonies, Shankell, Armagh, Ireland. M i Samuel Valentine HOLLINGSWORTH was born on 27 Jan 1673. He died on 30 Aug 1758. M ii Enoch HOLLINGSWORTH "I" was born on 7 Jun 1675. He died on 24 Aug 1687. 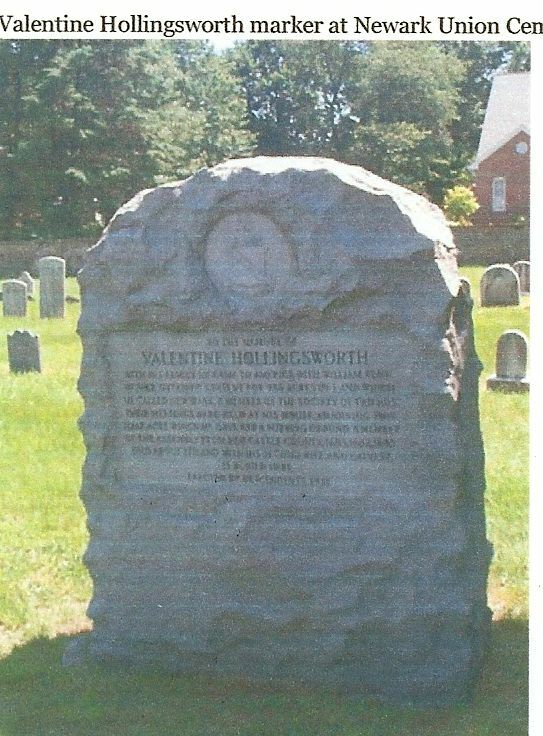 M iii Valentine HOLLINGSWORTH "II" was born on 12 Nov 1677. He died on 25 Mar 1757. F iv Ann HOLLINGSWORTH was born on 28 Dec 1680. She died on 26 Oct 1712. M v John Valentine HOLLINGSWORTH was born on 19 Feb 1684. He died on 22 Apr 1722. M vi Joseph HOLLINGSWORTH was born on 10 May 1686. He died about 1732. Henry Parker HOLLINGSWORTH [Parents] was born on 7 Sep 1598 in Hollingsworth Manor near Mottram, County Cheshire, England. He was christened in Quaker or Friends Church. He died on 27 Oct 1675 in Ballyvickcrannel, Segoe Parish, County of Armagh, Ireland. He was buried on 28 Oct 1675 in Friends Cemetery, Belleniskcannel, Parish of Legoe, County Armagh, Ireland. Henry married Catherine CORNISH on 12 Apr 1622 in Ballyvickcrannell, County Armagh, Ireland. Catherine CORNISH [Parents] was born in 1601/1602 in Wadesmill, County Armagh, Ireland. She died on 17 Oct 1697 in Ballensikcrannel, Parish of Segoe, County Armagh, Ireland. She was buried in Friends Cemetery, Belleniskcannel, Parish of Legoe, County Armagh, Ireland. Catherine married Henry Parker HOLLINGSWORTH on 12 Apr 1622 in Ballyvickcrannell, County Armagh, Ireland. M iv Valentine "The Imigrant" HOLLINGSWORTH "I" was born on 15 Aug 1632. He died on 13 Oct 1710. M v Henry HOLLINGSWORTH was born about 1633. M vi Thomas HOLLINGSWORTH "I" was born in 1634. He died in 1701. Stephen Cornish HOLLINGSWORTH was born in 1634 in Belleniskcrannell Parish of Sego, County Armagh, Ireland. He died in 1711 in , New Castle, Delaware. Robert HOLLINGSWORTH was born about 1635 in Belleniskcrannell Parish of Sego, County Armagh, Ireland. Richard HOLLINGSWORTH was born about 1636 in Belleniskcrannell Parish of Sego, County Armagh, Ireland. Zebulon HOLLINGSWORTH was born in 1636 in Belleniskcrannell Parish of Sego, County Armagh, Ireland. He died in 1713. Ruth Cornish HOLLINGSWORTH was born in 1638 in Belleniskcrannell Parish of Sego, County Armagh, Ireland. She died in 1715. Catherine HOLLINGSWORTH was born in 1640 in Belleniskcrannell Parish of Sego, County Armagh, Ireland. She died in 1646. Abigail HOLLINGSWORTH was born in 1642 in Belleniskcrannell Parish of Sego, County Armagh, Ireland. She died in 1663 in Goshen Twp, Chester, Pennsylvania. F xiv Mary HOLLINGSWORTH was born in 1644. Mary HOLLINGSWORTH was born in 1656 in Belleniskcrannell Parish of Sego, County Armagh, Ireland. Henry HOLLINGSWORTH was born in 1658 in Belleniskcrannell Parish of Sego, County Armagh, Ireland. Katherine HOLLINGSWORTH was born in May 1661 in Belleniskcrannell Parish of Sego, County Armagh, Ireland. Thomas HOLLINGSWORTH was born in 1661 in Belleniskcrannell Parish of Sego, County Armagh, Ireland. M xix Samuel HOLLINGSWORTH was born on 19 Feb 1664. He died about 1722. Nicholas Wray REE was born in 1596 in Tanderagee, County Armagh, Ireland. He was christened on 20 Oct 1597. He died in 1680. Nicholas married Ann De TANDERAGEE in 1627 in Armagh, Ireland. Ann De TANDERAGEE was born in 1600 in Of Tandragee, Parish of Ballymore, County Armagh, Ireland. She died on 1 Feb 1671 in Ballymacrannell, Seagoe, Armagh, Ireland. Ann married Nicholas Wray REE in 1627 in Armagh, Ireland. F i Ann REE was born in 1628. She died on 1 Feb 1671. Halcott "Hocky" PRIDE [Parents] was born in 1730 in , Henrico, Virginia. He died on 20 Oct 1774 in , Henrico, Virginia. Halcott married Mary BRIGGS about 1700. Mary BRIGGS was born in , , Colony of Virginia. She died in , Henrico, Virginia. Mary married Halcott "Hocky" PRIDE about 1700. F ii Lucy PRIDE was born about 1758. She died in 1783. F iii Mary Holcott PRIDE was born about 1717. She died in 1795. 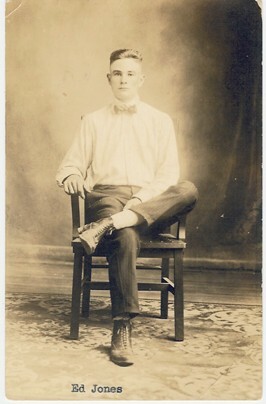 Charles Franklin "Charlie" PALMER [Parents] was born on 27 Aug 1894 in Bridgeport, Wise, Texas. He died on 23 Jan 1946 in Ada, Pontotoc, Oklahoma. He was buried on 25 Jan 1946 in Memorial Park, Ada, Pontotoc, Tx. Charles married Minnie Lena JONES on 8 Jul 1917. 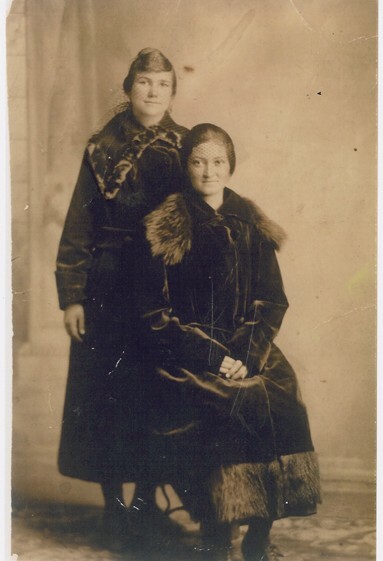 Minnie Lena JONES [Parents] was born on 14 Sep 1901 in Indian Territory, Bebee, Pontotoc, Oklahoma. She died on 8 Nov 1983 in Ada, Pontotoc, Oklahoma. She was buried on 10 Nov 1983 in Rosedale Cemetery, Ada, Pontotoc, Oklahoma. Minnie married Charles Franklin "Charlie" PALMER on 8 Jul 1917. F i Ola Mae PALMER was born on 13 Jun 1918. She died on 2 Jan 1987. F ii Bertha Juanita PALMER was born on 29 Apr 1920. She died on 17 May 1973. F iii Amelda Ruth "Bug" PALMER was born on 24 Jun 1927. She died on 12 Nov 2001. M iv Charles Estele "Sonny Boy" PALMER was born on 19 Mar 1937. He died on 2 Sep 1977. Pleas Edward JONES [Parents] was born on 12 Feb 1903 in Indian Territory, Bebee, Pontotoc, Oklahoma. He died on 12 Jul 1964 in Ada, Pontotoc, Oklahoma. He was buried in Ada, Pontotoc, Oklahoma. 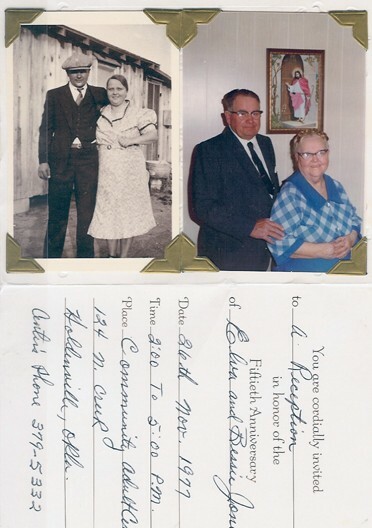 Pleas married Maudie Bertha MEDLEY on 24 Dec 1920 in Bebee, Pontotoc, Oklahoma. Maudie Bertha MEDLEY [Parents] was born on 26 Aug 1903 in Indian Territory, Tyrola, Pontotoc, Oklahoma. She died on 1 Mar 1972 in Ada, Pontotoc, Oklahoma. She was buried on 4 Mar 1972 in Rosedale Cemetery, Ada, Oklahoma. Maudie married Pleas Edward JONES on 24 Dec 1920 in Bebee, Pontotoc, Oklahoma. F i Ruby Geneva JONES was born on 3 Jan 1922. She died on 13 Jun 1986. M ii James Edward JONES "Sr" was born on 30 Jun 1927. He died on 24 Jun 1976. 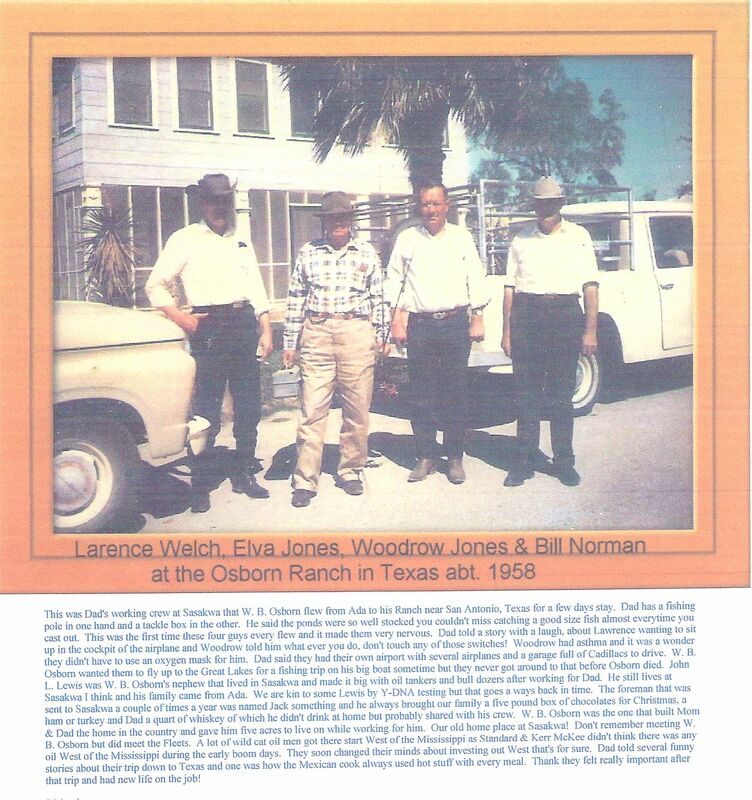 M iii Fred Loen JONES was born on 11 Jun 1930. He died on 3 Feb 1993. Rev. Bert JONES [Parents] was born on 2 Aug 1906 in Bebee, Pontotoc, Oklahoma. He was christened in Pentacostal Holiness Church. He died on 17 Feb 1980 in Bebee, Pontotoc, Oklahoma. He was buried on 20 Feb 1980 in Maxwell Cemetery, Pontotoc, Oklahoma. Bert married Vernal Alice MELTON. Vernal Alice MELTON [Parents] was born on 12 Mar 1908 in Stratford, Garvin, Oklahoma. She died in Aug 1976 in Norman, Cleveland, Oklahoma. Vernal married Rev. Bert JONES. F i Lula Louise MELTON was born on 5 Feb 1924. She died on 19 Mar 2009. Rev. Bert JONES [Parents] was born on 2 Aug 1906 in Bebee, Pontotoc, Oklahoma. He was christened in Pentacostal Holiness Church. He died on 17 Feb 1980 in Bebee, Pontotoc, Oklahoma. He was buried on 20 Feb 1980 in Maxwell Cemetery, Pontotoc, Oklahoma. Bert married Winona Jewel ISAACS on 6 Feb 1926 in Near Bebee, Pontotoc, Oklahoma. Winona Jewel ISAACS [Parents] was born on 11 Jul 1907 in Stratford, Garvin, Oklahoma. She was christened in Pentacostal Holiness Church. She died on 8 Feb 2000 in Allen, Pontotoc, Oklahoma. She was buried on 11 Feb 2000 in Maxwell Cemetery Pontotoc, Oklahoma. Winona married Rev. Bert JONES on 6 Feb 1926 in Near Bebee, Pontotoc, Oklahoma. M i Uel O'Dell JONES was born on 15 May 1927. He died on 19 Sep 2009. F ii Ovella Parthenia JONES was born on 15 Jun 1929. She died on 27 Dec 2014. F iii Naomi Juan JONES was born on 11 Mar 1932. F v Deloris Winona JONES was born on 21 Aug 1937. F vi Bertie Lou JONES was born on 8 Aug 1939. Elva Milo JONES [Parents] was born on 18 May 1908 in Bebee, Pontotoc, Oklahoma. He died on 23 Jan 1983 in Holdenville Hospital, Holdenville, Hughes, Oklahoma from Cancer. He was buried on 26 Jan 1983 in Maxwell Cemetery, Pontotoc, Oklahoma. Elva married Bessie Alta HAYES on 30 Nov 1927 in Rev Walker Home n. Bebee, Pontotoc, Oklahoma. 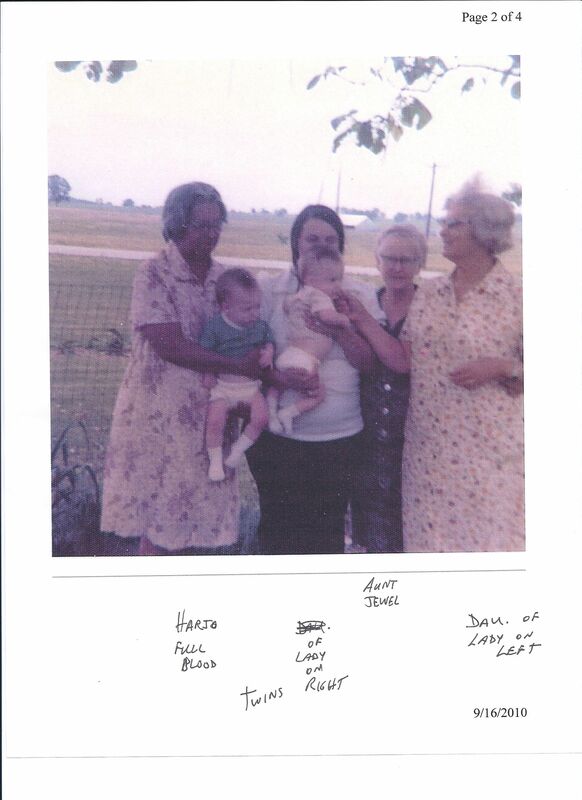 Bessie Alta HAYES [Parents] was born on 10 Dec 1908 in Stratford, Garvin, Oklahoma. She was christened in Church of God of Prophecy. She died on 18 Jan 1987 in Holdenville, Hughes, Oklahoma. She was buried on 20 Jan 1987 in Maxwell Cemetery, Pontotoc, Oklahoma. 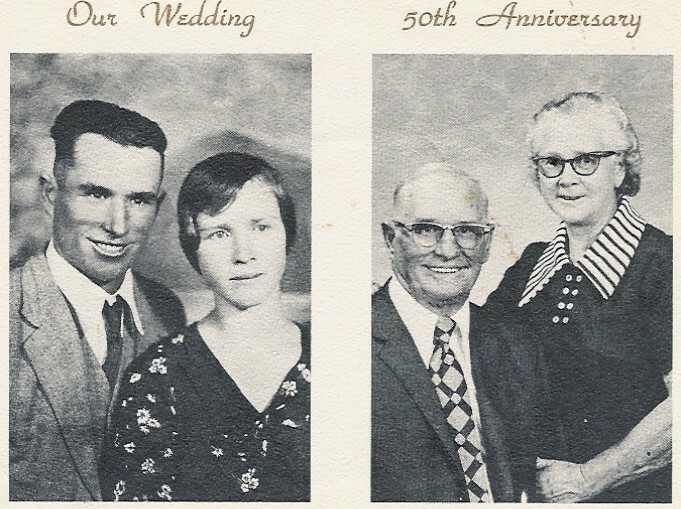 Bessie married Elva Milo JONES on 30 Nov 1927 in Rev Walker Home n. Bebee, Pontotoc, Oklahoma. M ii Charles Lee JONES was born on 29 Jan 1934. He died in Sunday 19 Jun 2016. M iii Derrell Dewayne JONES was born on 1 Jun 1936. He died on 3 Apr 1996. F iv Alta Marie JONES was born on 5 Jun 1939. M v Richard Dale JONES was born on 15 Oct 1942. M vi Gerald Ozell JONES was born on 22 Mar 1948.